The Universal Sigh: better than The Metro? It feels like an eternity since Radiohead rush-released The King Of Limbs, but today the band's eight album finally makes a physical appearance. 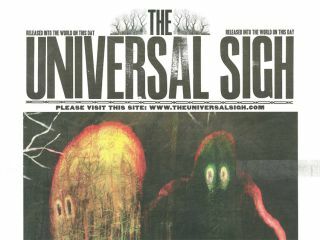 Not to be confused with The King Of Limb's special 'Newspaper' edition, Radiohead have put together another newspaper called The Universal Sigh, available for collection from various locations around the world, free of charge. It has, of course, already been uploaded as a PDF (WARNING: contains lots of poetry about trees), and put up for sale on eBay (just the one so far in the UK - £41 at time of writing). Authors include the band (presumably), Robert MacFarlane and Jay Griffiths. Head over to TheUniversalSigh.com for pictures of some of the proud owners. UPDATE: We're told that Thom Yorke has been handing out copies of The Universal Sigh in person outside the Rough Trade East record shop in London. This Is Fake DIY have some nice pictures of him doing just that. A 24-bit FLAC version of The King Of Limbs is also available for the first time today exclusively through 7digital. It marks the first 'better-than-CD' digital release of its kind from a major artist, and Apple is rumoured to be in talks with labels to make this a regular feature. Should please audiophiles, anyway - yours for £8.99. You can read our track-by-track review of The King Of Limbs here. Or if that's not enough to convince, head over to The Guardian to stream the album in full. True to Radiohead-form, there's also some nice accompanying artwork.